Also, Tamariu was one of the sea accesses for the city Palafrugell. However, the original modest fishermen's beach has suffered approximately the same fate as Calafell and Llafranc: a tourist avalanche, but with the simple difference that it reached Tamariu much later. Not too far away is the little cove "Aigua-xellida", closed in by very steep cliffs. Further on, the magnificent sector of Fornells, with the little natural harbor Enclanya, Punt del Mut and the unique marvel Aiguablava. 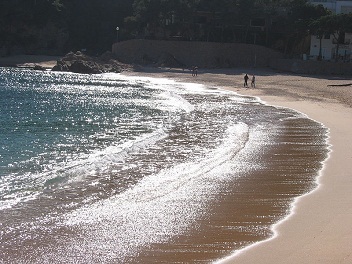 Writer Josep Pla, talking about the beach of Tamariu, said: "This curve is so gentle, so synthetic, lineal and well drawn, so free of appendages and inessential elements, that its effect has been compared to that of a Chinese painting - the whole of this extensive zone is full of pines of a dark coniferous green with the occasional patch of gentler-toned carob trees." The "Brava" of Costa Brava means "rugged" or "wild" and nowhere is this characteristic of the coast more obvious.